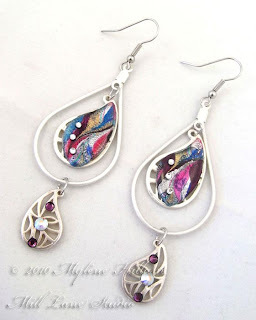 Here's another piece I've made up using the samples from my demos at the Brisbane Paper Crafts Festival. 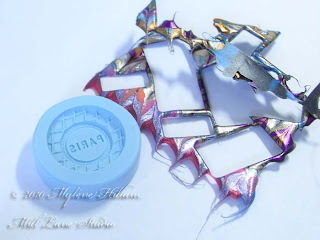 This was a marbled strip in lovely shades of turquoise and purple which I cut with rectangular cookie cutters. 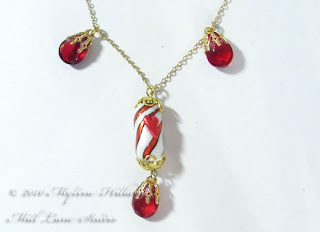 I loved the colour combination, especially with the hint of red to spice it up and I knew straight away that it was destined to be made into a piece of jewellery. But when it came time to assemble into a necklace it proved to be a little bit of a challenge. The striking colour combination was competing with every bead and colour combination I tried, which is a lesson in itself - sometimes, it's better to simplify! So with that in mind, I came up with a simple stringing idea - just a few crystal set dangles in between the rectangles and it's become an elegant choker - simple but effective! Before I assembled anything, I gave each rectangle a coat of resin - that's five fronts and five backs and left them to cure overnight. Then I took a length of 18 gauge non-tarnish gold wire and bent it into a gentle curve. I laid out all the backings, face side down, on a non stick mat using the curved wire as a guide. I left just enough space between each rectangle for the dangle to be attached later. Then I heated the back of all 5 pieces with the heat gun until they were softened and placed the wire down into the Friendly Plastic. 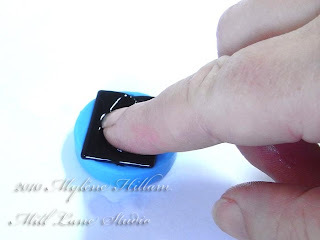 Make sure you have wet fingers when you do this because both the wire and the plastic are hot and of course, the Friendly Plastic will stick to you. One by one, I placed the top pieces in place, pressing them down gently to sandwich the wire securely in between. I let the whole piece cool down on its own rather than plunge the wire into a water bath - no sense in encouraging rust! I turned loops on the ends of the wire and hooked on the chain adding a clasp on the other end to finish it. Finally, I added the crystal set dangles. And there you have it - Friendly Plastic...... simple and stunning! Now here's a quick and easy project: Friendly Plastic teamed with silver jewellery findings to create a unique pair of earrings. 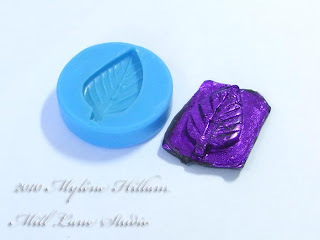 Using Friendly Plastic and the marbling technique, I've cut out two leaves with a small cutter and given them a coat of resin. All that's needed to transform the Friendly Plastic from fantastic to fabulous is the glitz of a few Swarovski crystals - after all, what would drop earrings be without bling?!! Notice how the leaf shape mimics the paisley links - they're a good match for each other and because the leaf is slightly narrower than the paisley base you can see the outline of the paisley. After that, the only jewellery making skill you need to put these earrings together is knowing how to open and close jump rings. I've linked the silver paisley shapes to a teardrop frame. The fantastic paisleys are from the Organics range (Horizons Group) and the silver teardrop is from Plaid's Fresh range. I'll be drawing the winner of the Glitter Artistry book giveaway tonight so this is your last chance to enter the draw. 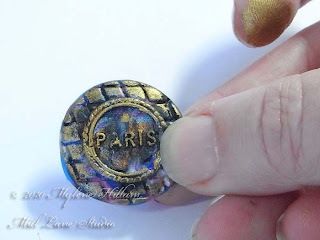 All you have to do is to leave your comments on my post: All that Glitters. Good luck! They say it's a woman's prerogative to change her mind. It's something I do often when I'm designing a project. I have an idea, I start to put it together and then another idea comes into my head and I change my mind. It's a great way to explore new possibilities. 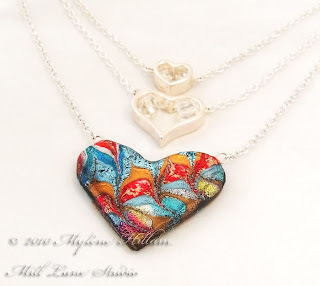 Take this necklace for instance. 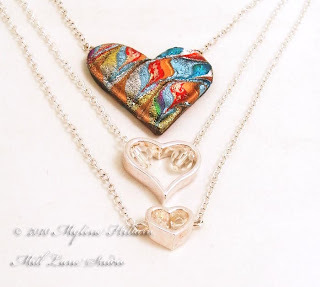 When I first had the idea to incorporate the two silver hearts into the design, I was going to hang the small and medium hearts below the Friendly Plastic heart..... and I was quite pleased with the way it looked. But then, just as I began to assemble the pieces, it happened - I changed my mind! A different idea popped into my head: What if I changed the order of the hearts? What if I placed the smallest heart at the top of the design and the largest heart at the bottom? I like how that looks even better! Rearranging the hearts has completely changed the balance of the piece. And it's unexpected - you expect the design to taper at the bottom of the pendant - but reversing the order has made the piece much more interesting. Isn't it wonderful to be a woman just so you can change your mind? I normally reserve glitter for Christmas crafting, feeling that the sparkly metallic colours were a bit out of place during the rest of the year. But after having the chance to work with some of the Art Institute Glitters recently my eyes saw glitter in a whole new light. You see, Art Institute Glitter comes in an enormous range of opaque and transparent colours too - glitters that sparkle but don't look out of place the rest of the year! 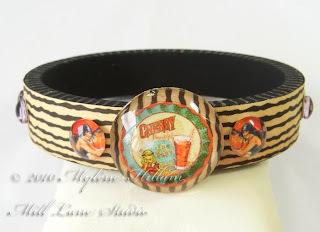 Just recently I shared several wooden bangles that I had decorated with glitter and each one looks totally different to the next and I think that up until then I'd been stuck in the "glitter is only for Christmas" mode of thinking. 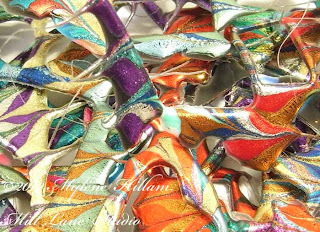 But with an entire range of non-tinsel colours and effects to choose from I realised how very versatile it is - glitter belongs in our day to day world and the world should be just a little bit more sparkly! That's how Barbara Trombley sees it too. Barbara is the author of Glitter Artistry, a book dedicated to spreading the word about glitter - in particular, Art Institute Glitter. It seems that Barbara has been using glitter forever.... long before it became popular in papercrafting. She loves glitter so much that she launched her own line of glitter products from micro fine glitters right through to glass shards. 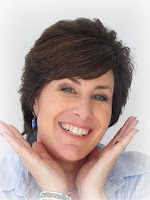 In Glitter Artistry she highlights how to use each of the products and has designed a variety of projects using them. 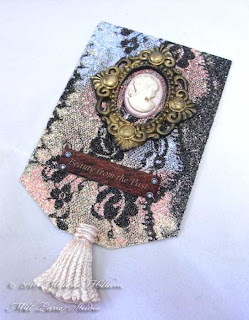 For the fun of it, I've taken her lace technique and put my own spin on it using Art Institute Glitter, Krafty Lady Art Moulds (AM167 Tassel, AM200 Oval Frame) and a cameo button from Blumenthal Lansing. 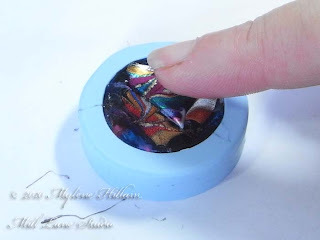 Glitter Artistry also suggests the best adhesives and tools to use and then moves into the techniques used for the featured projects in the book. Courtesy of the fine folks at Lark/Chapelle publishers I have a copy of Glitter Artistry to give away. 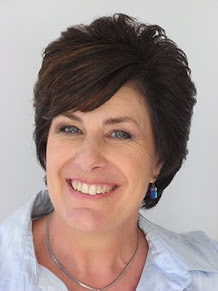 If you would like to see the world the way that Barbara sees it, leave your comment at the bottom of this post for your chance to win a copy of her book. I will randomly draw a winner on Tuesday night, 23rd Feb. The draw is open to both Australian and international readers and I will pick up the cost of posting the book to you. Don't forget to leave me your contact details so I can contact you if you win. Let's sparkle...... and spread a little glitter around the world! 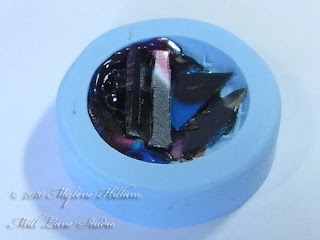 Earlier in the week I showed you how to mould with Friendly Plastic Designer Sticks. 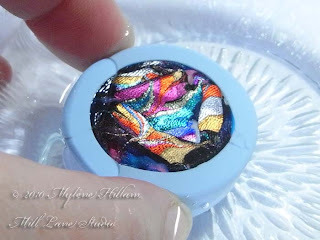 But today I want to show you how to use up all the scraps and offcuts you have left over from other Friendly Plastic projects to make your own unique embellishment for your projects. 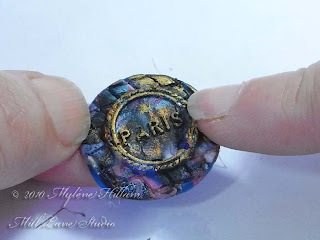 You'll need scraps of Friendly Plastic, a mould (I've used Krafty Lady art mould AM298 Lge Paris), a heat gun, Tim Holtz Tonic scissors and a bowl of cold water. Cut the Friendly Plastic into small pieces. 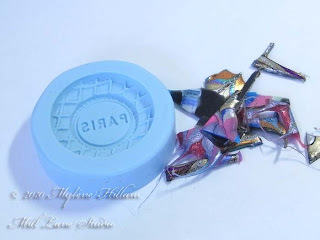 Place the scraps into the mould in a single layer and heat with the heat gun until they are softened. Dip your fingers in cold water and press them into the softened plastic to press the pieces together. You are trying to pick up all the detail in the bottom of the mould so allow the pieces to spread across the bottom as you press. Place another layer of scrap on top and heat. With wet fingers press the pieces together. Keep adding layers in this fashion until the mould is full. You can even add the bits from the teeth of the marbling comb - there is no wastage with Friendly Plastic. Fill the mould until it is full - it doesn't matter which way up you place the pieces. Make sure this top layer is level with the top of the mould so that you have a flat bottom on your cast. Place the mould in cold water and leave it to set. It will take just a few minutes. To remove the cast from the mould just bend the edge of the mould back and the cast will remove very easily - you never quite know how the cast will look! 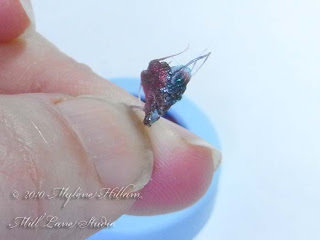 You can colour the cast with alcohol ink, Krylon Leafing Pen or AMACO's Rub 'n Buff. I chose Gold Leaf Rub 'n Buff for this piece. I've squeezed a little on my finger......... and lightly coloured the raised areas of the cast. And now my embellishment is ready to be used in my next project. 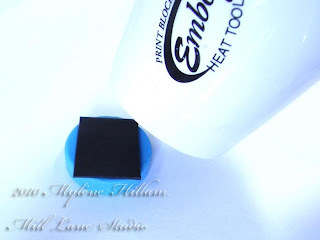 You can find the full tutorial on my website - it's in printable pdf format so you can print it out for easy reference when you are trying this technique. 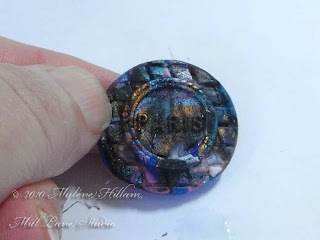 Now that you've seen how easy it is to mould your own embellishments I hope you'll save all your Friendly Plastic scraps and give this a go. 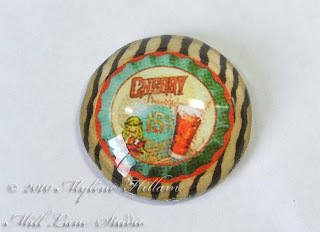 As a card maker and paper crafter, I love to create embellishments to add to my projects. And being on the Krafty Lady Design Team I have access to some of the best moulds available for that very purpose. 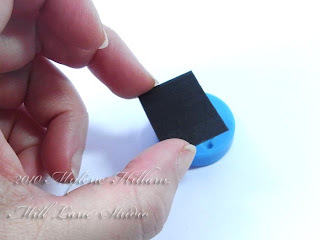 These moulds are wonderful: apart from the fabulous array of designs, and the fact that they are made from silicone so nothing sticks to them, they are also very flexible, making demoulding a breeze. 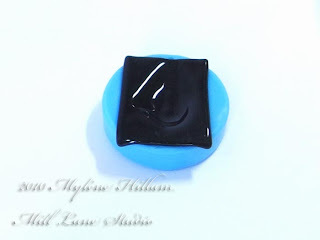 I've used these moulds to cast every kneadable or pourable medium I could lay my hands on including soap, wax, polymer clay, air dry clay, resin, Opals and UTEE. They've stood the test admirably and are as good today as they were when I first used them, literally hundreds of casts ago. 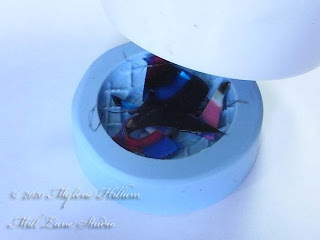 Gather all the materials you'll need: Friendly Plastic, Krafty Lady art mould (I've used AM247 Leaf Med), Tim Holtz Tonic scissors (because they cut Friendly Plastic so easily), a heat gun and a bowl of cool water. Cut a strip of Friendly Plastic slightly larger all around than the mould cavity. Place it in the mould cavity foil side down. Heat it with the heat gun until it turn glossy...... ....and begins to slump down into the mould. Dip your finger tips from both hands into water - it's amazing how often you accidentally touch the Friendly Plastic with your non-moulding hand and it sticks to you. Press the Friendly Plastic down in the mould making sure you push it into all the nooks and crannies. Place the mould and Friendly Plastic into the bowl of cool water and leave it to set (usually about 30 seconds). Once it's cooled, remove it from the water and you'll find the Friendly Plastic cast will just lift out of the mould. Here's the finished cast. If you were adding this to a papercraft project you could leave it as a rectangle so that you have something to attach it to your page or card with. Pritt Power Gel or strong double sided tape should do the trick. 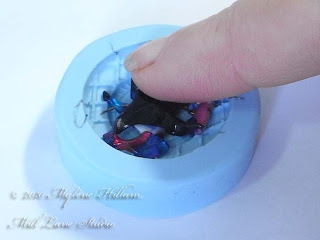 If you prefer to trim the excess away, then look for silicone adhesive to fill the back of the mould (my favourite is Helmar) but if you need something archival then choose Scrap Dots (also by Helmar). 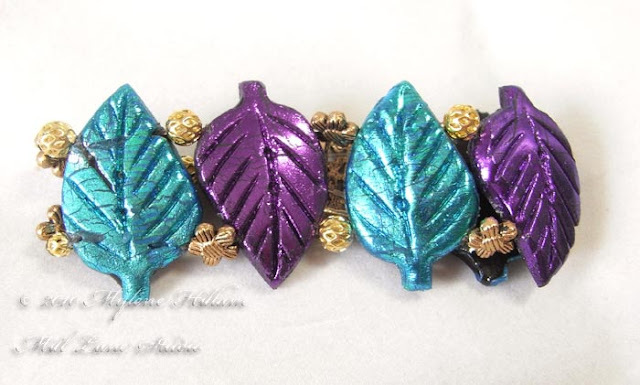 For jewellery projects, try drilling a hole through the leaf stalk once the piece is cooled. You can download and print this tutorial in pdf format from the tutorials page at Mill Lane Studio. It's been Paper Crafts Festival time in Brisbane this weekend. Spending time at a paper crafts show is always a fun way to spend a weekend. I spent a few hours each day demoing Friendly Plastic: a slot on the stage each morning and then a stint on the Stamp Antics stand each afternoon. So I thought you might like to see what I got up to. 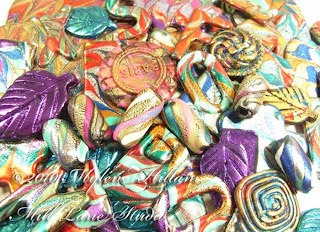 What you see above is just a small sampling of the all the pieces I created during the demos - I did a lot of marbling and cutting, casting, bead making and texturing so now I have a big pile of pieces ready to be turned into other creations. and then a matching bracelet. I'll try to get a few more pieces posted over the next week or so. But my, oh my, oh my...... look at the big jumble of cutouts I have left! I'll show you one way to use them all up in the next couple of weeks, so look out for a tutorial on how to mould with them. This is one of the wonderful things about Friendly Plastic - no bits go to waste! 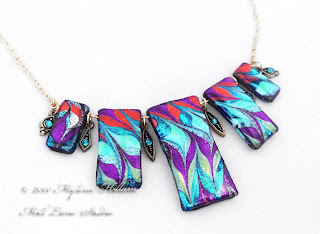 And just a quick reminder that the Friendly Plastic and Resin pendant class is filling quickly. 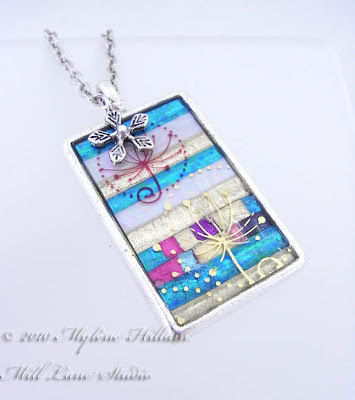 So if you'd like to join me on March 6 to create this pendant, just give Stamp Antics at Wynnum West a ring (07 3393 3022) to make your booking. Well, here we are at the final day of the bangle assignment. When I think back to the first day of the challenge and the scary moment when I realised that these were not my materials of choice, I had no idea that some of these designs were hidden inside the supplies I would be using. Even I'm surprised by how well some of the bangles have turned out. So let's see how I did with the final bangle of the challenge. 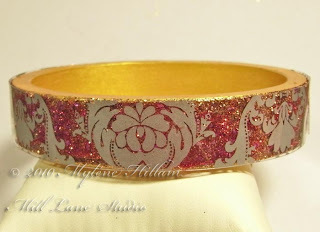 You can begin by painting the inside and top and bottom edges of the bangle with Bright Gold Lumiere paint. You'll probably notice in the photo below that my bangle isn't painted but that's because I forgot to do it first and had to carefully paint around glitter later on. So, to make things easier for yourself, paint the bangle first. 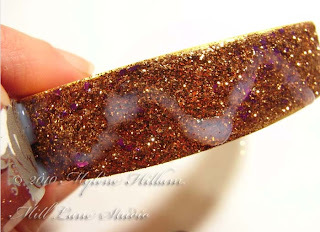 Then cover a section of the outside of the bangle with Designer Dries Clear and spread it out evenly with your finger. 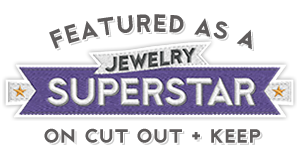 Sprinkle it with Vintage Glass Glitter (903 Alexandrite) from Art Institute Glitter. 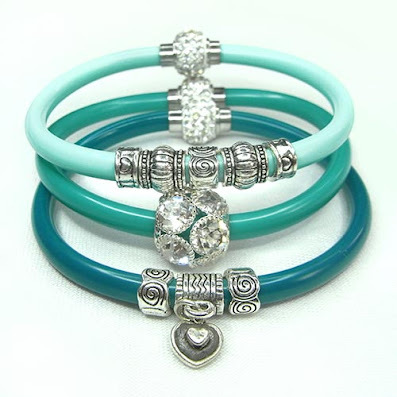 Repeat all the way around the bangle. 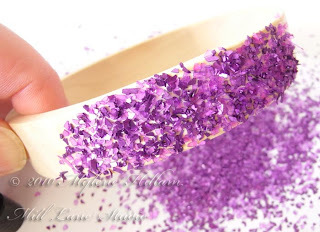 Allow it to dry for a few minutes and then rub away any loose flakes so that you have a patchy cover. 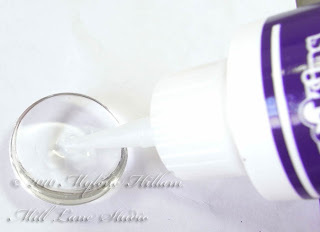 Apply another coat of Designer Dries Clear to the bangle working in small sections at a time. Cover with gold glitter and tap away the excess. Continue until the whole bangle is covered. 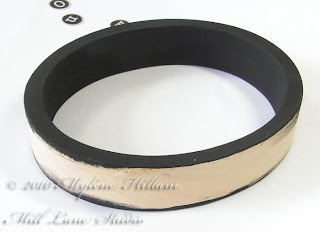 Cut a strip of printed acetate measuring the width and circumference of the bangle. I've used one of the beautiful hand silk-screened overlays from Hambly Screen Prints. The imagery on these overlays is just stunning and the designs are so clean - I think that I'm in loooove with this range! 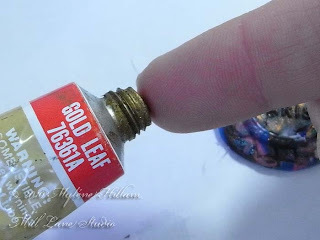 Still working in small sections at a time, apply a generous amount of Judikins Diamond Glaze over the glitter and spread it out with your finger making sure you go all the way to the edges. 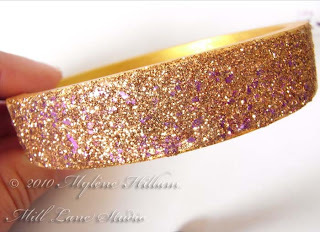 And I learned a lesson here: Diamond Glaze caused the colour of the Vintage Glass Glitter to run but it's left a lovely soft pink haze about the bangle which I quite like, but if you don't want that to happen, then coat it with a sealant before using Diamond Glaze. 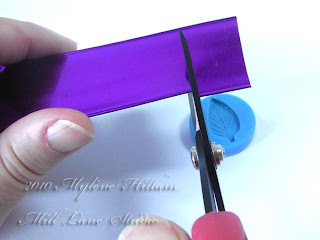 Place the acetate band on the surface and hold the end in place with a peg. 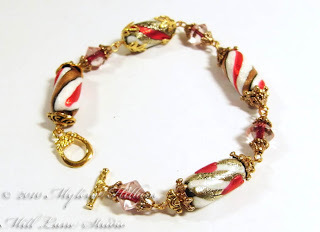 Continue working in small sections until the whole bangle is covered and then place the peg where the two ends meet and set it aside until it has dried completely. 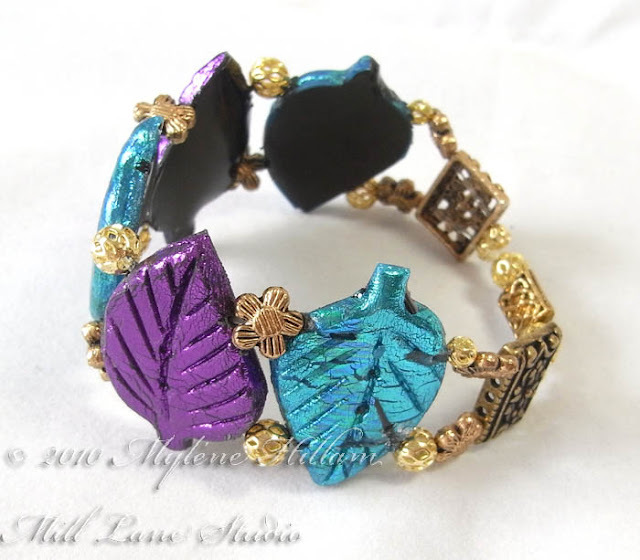 And here's the finished bangle: a mixture of glitz and elegance. 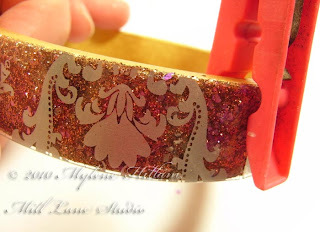 The materials for today's bangle were supplied by Art Institute Glitter, Judikins, Jacquard and of course, Diy Bangles who supplied all the oval bangles for this challenge. Thank you to you all. 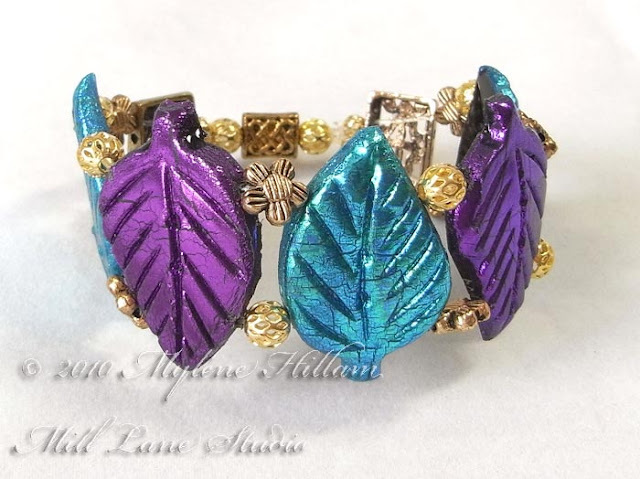 Thanks for joining me during Bangle Week at Mill Lane Studio - it's been a fun experiment. 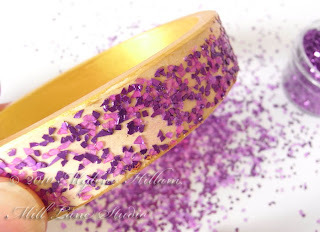 I hope you've enjoyed the tutorials and will have a go at decorating your own bangles. Today I'm going in a completely different direction to the bangles that I've created so far in this challenge. Courtesy of Graphic 45, I have papers to work with. I have always enjoyed the soft, aged appearance of their paper imagery and whilst it's not a style I use a lot, I can appreciate the romance of a more gentle, bygone era. I think that's what draws a lot of people to this style. I'll be working with one of their new releases, On the Boardwalk. 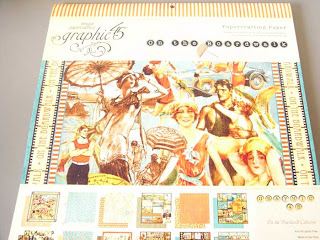 This 12 x 12 paper pad has 22 double sided papers in 12 different designs including 2 sheets of pre scored tags and borders. 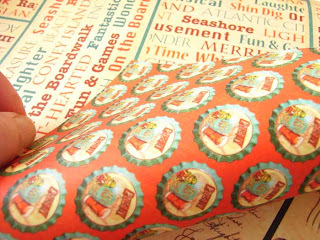 I've selected a stripe, a bottle cap as my feature, and a couple of smaller motifs from a border. So let's get started. 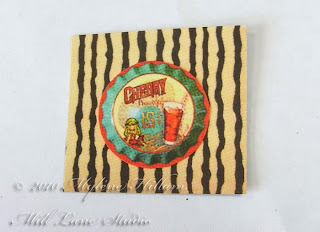 Cut a square from the striped sheet and the bottle cap image leaving a small border. 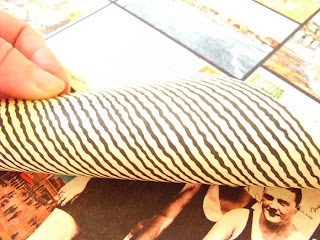 Layer them together using a glue stick with the stripes running vertically. Apply a small circle of Diamond Glaze to the centre of the back of a glass pebble. This one is from ecoGreen Crafts. Then attach the layered image, pressing out any air bubbles. Leave it to dry and trim away the excess. 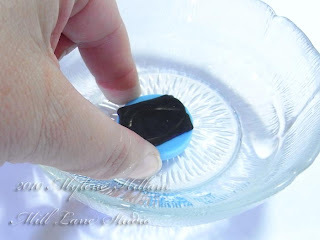 Paint the inside and the top and bottom of the oval bangle with black acrylic paint. Set it aside until later. For the next step I've cut the name of the collection (On the boardwalk) from the front cover of the paper pad. Remember how I'm only allowed to use the materials I have on hand? Well the title is just the perfect size for this project so I'm making use of it! 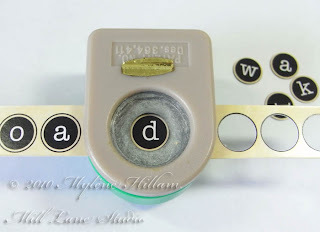 Punch out the individual letters using a small circle punch. These glass pebbles are from ecoGreen Crafts. 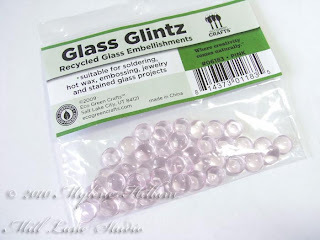 They are just 8mm across and made from recycled glass - great for the eco conscious crafter. 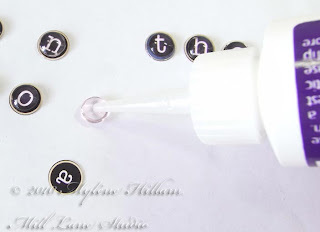 Attach them to the letters by placing a dot of Diamond Glaze on the pebble and pressing the letters in place. My letters are slightly larger than the pebbles but I didn't trim them. Cut a piece of the striped paper the width and length of the bangle's outer circumference and use white craft glue to adhere it. 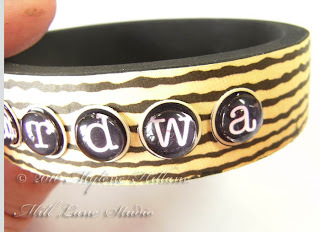 Work out the placement of the letters around the bangle and attach them with Diamond Glaze. I've placed them around the back and sides of the bangle. I also had two medium sized glass pebbles on hand and I've attached a bathing beauty image from one of the papers to each one. Once they dried, I trimmed away the excess and placed them on either side of the larger pebble on the front of the bangle. And finally, to add some interest to the top and bottom of the bangle I've drawn in some uneven stripes using a Sakura Stardust Clear pen. I love this pen because it works well on both light and dark surfaces and on the black paint it takes on a more golden tone so that it matches really well with the striped patterned paper. 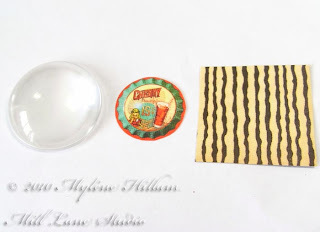 Today my thanks go to Graphic 45 for the great paper pad - it has been a pleasure to work with these papers; to Sakura for the Stardust Pen which is one of my recommendations for your basic kit; and to ecoGreen Crafts for the glass pebbles used in the project. 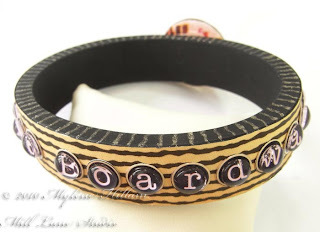 Tomorrow will be the last in this Diy Bangle challenge as I've run out of oval shaped bangles. Check back to see what else I can come up with from the materials I have in my hotel room.